You just might recognize these guys!! I just blogged their wedding, and the reason behind posting this lovely session next is because the day after Cassie & Brint said "I Do", they got together with me again! For a newlywed session! How cool is that!? 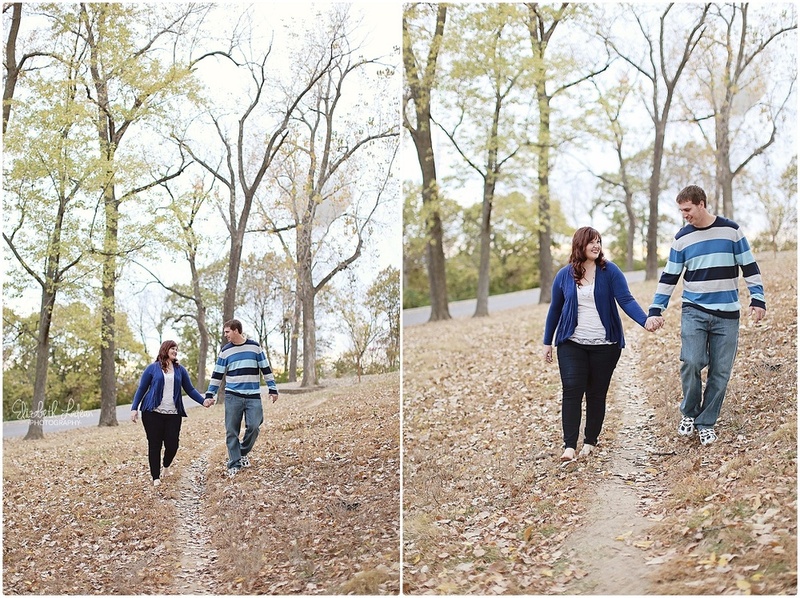 C&B were married on Sunday, October 25th, 2015 - and on Monday the 26th, we three got together at Waterworks Park in Kansas City to celebrate those brand new nuptials with photos! Talk about an anniversary! ONE DAY anniversary! Ha! Cassie & Brint are two of the most fun people I've ever met, they're both so relaxed and laid-back, love to talk like old friends, and are just generally really nice to be around. We wandered all over that insanely hilly park and Brint constantly watched out for Cassie's well-being. Watch that branch, oh careful here's a big rock. He adores her. And she too, adores him. It's no doubt that these guys have a long and happy life together ahead of them. Go here to see Cassie + Brint's Wedding Day! Six-Month Photos Session | Baby Sam!